As poets have observed, there are certain inevitabilities in life that cause great trepidation. For homeschooling parents, one of these is preparing our college-bound high school students for taking the SAT/ACT test. Homeschooling parents must be involved. While all high schoolers feel a bit queasy sitting down with their number two pencils and staring into an abyss of blank ovals, homeschooled students might feel a heightened sense of concern. While many high schoolers in America take about six-dozen tests every week, many homeschoolers are not as familiar—or as comfortable—with taking tests in a limited time frame. Many students put off preparing for taking these tests. They tend to cram their studying in the two weeks previous to taking the test. Cramming for an ACT or SAT college-entrance test is less than ideal in preparing for a test that could result in serious financial aid. 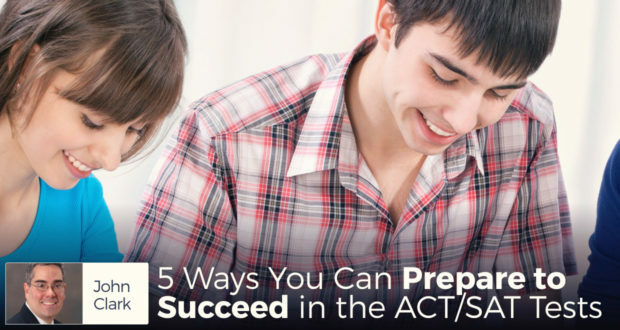 As a parent who has helped a few of my teenagers prepare for the ACT or SAT exams, I suggest a radically different approach: prepare for the test a year in advance. This doesn’t mean that you should administer dozens of sample tests for twelve months before the test date; I’m not heartless. But you should consider adopting a few things into your teaching methods. The following five tips will help not only with college entrance tests, but with being successful in college. College-prep tests, and other college tests, seem to be designed to be difficult to finish in the allotted time. You need to have the material “at your fingertips.” There might be lots of strategies to address this problem, but let’s not overlook the most obvious: it’s important for high schoolers to increase their reading speed. Many homeschoolers read quite a bit, and the more they read, the faster they usually become. But that’s not true for everybody. As a student, as much as I read, I was never a fast reader. Therefore, now would be a good time to help your children learn how to read faster yet understand the ideas. There are plenty of books and media that will show them how. If your high school student increases his reading time by 25% between now and test time, he will have gained a great advantage for finishing the test and an even greater advantage in finishing college tests and college assignments in the allotted time. The purpose is not to grant an insight into every area of human knowledge, but rather to quickly digest, analyze, and be quizzed on unfamiliar subject material. The ACT and SAT tests often ask questions about the motivations and goals of protagonists in fictional works. As your student reads fictional works, engage in conversations that help to understand character motivation. This is emphasized in the Seton English courses, which should help prepare for that portion of these tests. College entrance tests include sections on writing essays, which means that becoming a good essayist is increasingly important. Three books which could be of great help to become a much better writer are the following: Aristotle’s Rhetoric, Strunk and White’s The Elements of Style, and William Zinsser’s On Writing Well. Each of these books could easily be read within a week. I’ll throw in The Oxford Dictionary of Quotations for my fourth pick because learning how to incorporate a great quote is so helpful in building an essay. Your student should take practice exams. That seems pretty obvious, but there is something less obvious that you should do. Carefully grade these tests and help your student recognize the areas of academic weakness. Either review or teach what your student needs to know. Imagine, for example, that your child missed the grammatical concepts of verb tense and apposition. Have your student reopen the grammar workbooks and redo the lessons about these topics. Look on the SAT and ACT sites to find which calculators are allowed for the tests. Purchase an approved calculator at least a year before the test date so your student can be familiar and can quickly find the answers. By the time the test day arrives, your student should be much more confident with the calculator.